Katy texted me some pictures of the Grimmlins, busy at play over the weekend. 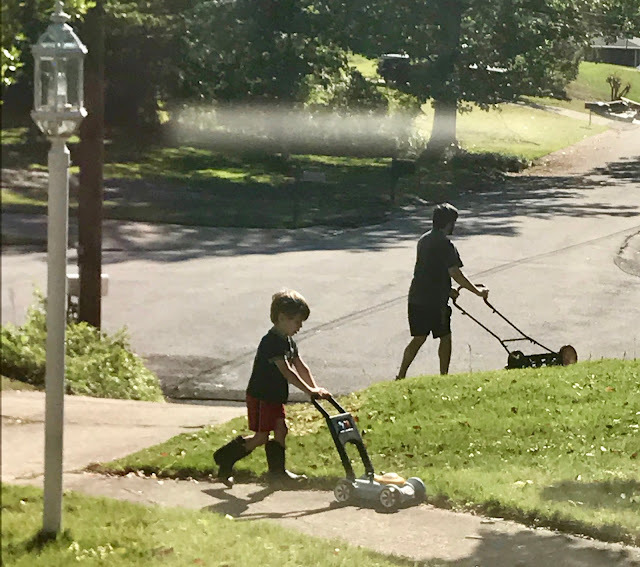 Ben was mowing the yard and Elliott is helping. Katy said Elliott really had his eyes on Dad, watching to see what he was doing and making sure his own mowing skills were up to snuff. Baylor is not one to love on his siblings very much so this was really touching. Thanks again all who pray for Baylor. It is the little things like this that make up hope that one day Baylor will be able to express all his feelings. Later in the afternoon, Daddy took Margaret on a date. So sweet....Katy and Ben do such a good job of parenting all their children. I have to say that Margaret and Elliott are growing up to be such caring children because of Baylor. Both feel strongly that they are Baylor's mentors as well as siblings. Today is errand day...several things to get in the mail. Thankful that I have a mother to send a card to as many of my friends have only sweet memories of their moms. Those Grimmlins are so cute. Those moments are the little things in life that make it so sweet. My mom has not felt well for a month. I went over yesterday to just sit with her. Her stomach is just so messed up, so I am trying to monitor what she eats. We have a doctor appointment before her June trip, but quite frankly I think her diverticulitis is just stirred up and she needs to give it time. All of the photos are precious but you know the one of Baylor melts my heart. Prayers continue for this sweet family. I hope you all have a wonderful Mother's Day, including your Mom. Precious little Grimmlins. You are certainly blessed with a sweet family! It is a huge blessing to see our children become such great parents to our grandchildren! It's true that a picture speaks a thousand words ..... as yours do. Wonderful pictures and of course that wonderful one of the boys at the swings ... speaks a thousand words and more. As you said, it really gives hope for Baylor. 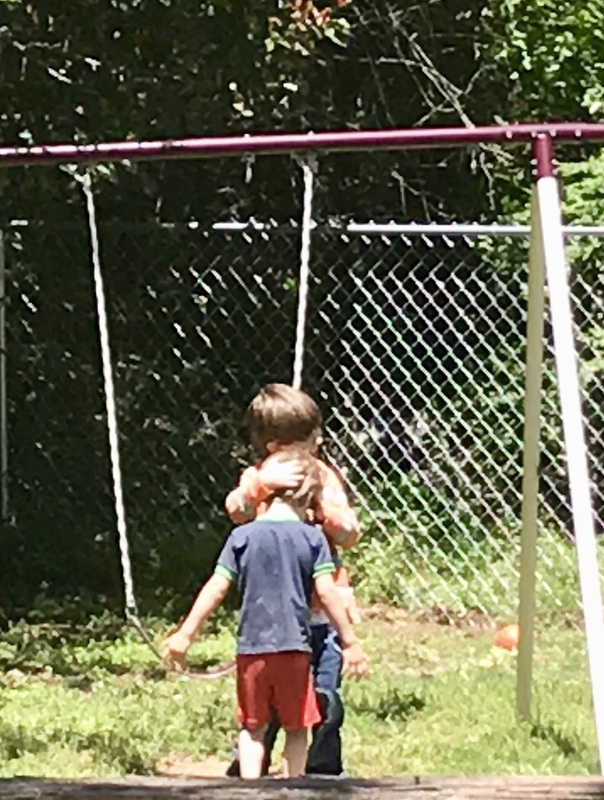 That is so very precious that both Margaret and Elliott see themselves, even at their tender ages, as mentors for Baylor. More than that, it's an answer to prayer, as I have felt led to pray regularly for both Margaret and Elliott to have wisdom and compassion in their interactions with their brother. So thankful to see how God is answering! Those kiddos are adorable and that picture of Baylor and Elliot brought tears to my eyes. Melted my heart!! Still having your mom is such a blessing!! Those pictures are just adorable and those kids are such blessings! Thank you for all the kind comments. I know that the prayers many of you have prayed over Baylor have produced fruit.